In a recent CNN story entitled ?Down, boy!? Dogs welcome military masters? CNN?s Jeanne Moos ?takes a look at some overzealous greetings by dogs welcoming home their military masters.? 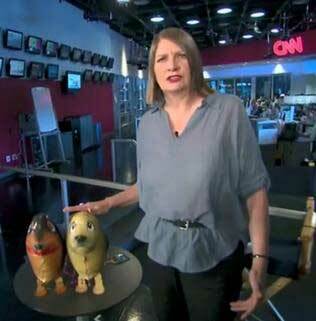 with their dogs, Moos shows her viewers two of the My Own Pet Balloon walking dog balloons and says this is ?for those of you who think the joy pets bring is hot air.? ?It?s the next best thing to a reunion? Moos declares as takes her My Own Pet Balloons for a little walk.